Turnberry was a market leader when they decided that the luxury condominiums should be located on what was then the north Strip. This was necessary to be located away from the casinos because of the need for more than one tower space. Turnberry Place real estate was developed almost 10 years ago. Turnberry Place includes four 38 story towers, with 720 luxury homes worth $650 million. MGM Mirage along with a joint venture with Turnberry developed the The Signature Residences at MGM Grand Hotel. This included a three identical 40 story luxury condo hotel towers with 1,700 homes. The company is nearing the completion of the second 45 story Turnberry Towers on Karen Ave near the Las Vegas Hilton. There have been close to 50 closings several months ago with a $623,555 average condo for sale price per unit. Their largest project to date is the $2.9 billion Fontainebleau condo hotel. The real estate was purchased for $95 million for 3 acres of the Algiers motel and $45 million for the 21 acres of El Rancho site. Krystal Sands condominiums were planned for this site previously. Other high rollers in development have been purchasing land at incredible prices including MGM Mirage $444 million land across from the Sahara and $1.24 billion for the New Frontier by Elad. This is definitely making residential towers a more costly endeavor in the future. Turnberry Associates is developing two other high-rise residential projects in Miami and renovating the Fontainebleau in Miami. The company is also active in San Francisco, Houston, north Florida Virginia, Atlanta and a condo hotel in the Bahamas. Call 702-505-6988 for VIP Las Vegas home mls search by a Las Vegas real estate agent. 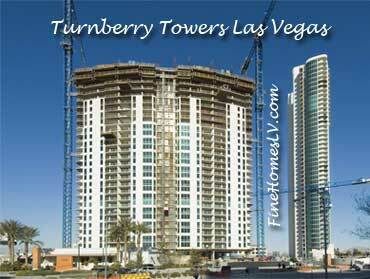 Turnberry Towers Las Vegas condos near construction completion for 2nd tower.